Game is unlikely to launch or run on modern systems "as is", requires significant tweaking to run. SWAT 3 may crash immediately after launching on Windows 7, 8, 10 because the codecs for the FMV videos are not supported on modern versions of Windows. Skipping the intro video is a good way of testing whether this issue is the cause of a crash on launch issue. Create a shortcut to the program, located at <path-to-game>\Swat.exe. Right click on the shortcut and choose "Properties". For more information, see our article on command line arguments. Performance is very low on modern operating systems. Extract D3DImm.dll and DDraw.dll to the installation folder, where swat.exe is located. The amount of time the AI has to determine its actions can be safely increased on modern computers beyond the normal 20ms maximum for much-improved AI. Open Swat.cfg in a text editor. Replace the numbers they contain (i.e. aiofficertime=20) with 200 (i.e. aiofficertime=200). aiofficertime and aisuspecttime are independent of each other - you could set aiofficertime to 200 and aisuspecttime to 20 to decrease difficulty by way of making suspect AI dumber, or vice-versa. You can try increasing the AI determination time further to, say, 2000, but the improvements may be minimal. This fix will need to be repeated anytime settings are modified from the in-game options screen. on by default. force off through graphics driver. Start a game and go to options screen. Set the resolution to 1024x768. It's recommended to set the other graphical options before editing config file as well. Save the settings and quit the game. Open Swat.cfg with a text editor. Find a line: res=1024 768 and replace the values with your own resolution. After that find a line: display_mode=1024 768 2 1 and change the resolution values as well leaving 2 1 at the end (e.g. for 1920x1080, display_mode=1920 1080 2 1. Save the changes and run a game. Menu is always rendered at 800x600 since the bitmap graphics are at that resolution. Resolutions higher than 1920 x 1080 may fail to load when using this solution. For higher resolutions, DgVoodoo2 may have to be used. Windowed mode requires 16-bit color mode. DxWnd and Windowed Borderless Gaming can be used together to force borderless window mode. Add -window to the end of the Target. 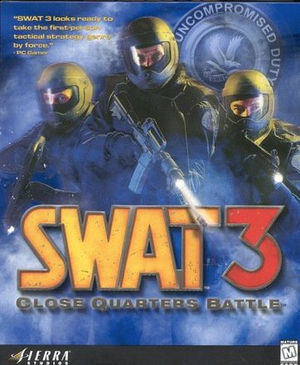 Point DxWnd at your SWAT 3 executable. Make sure to set the "DirectX Version to Hook" to "automatic". Run WBG. You will see the WBG icon in your System Tray. Right click on that icon and select "Settings", "Global Settings". Under "Add Window", choose a keybind that you will use to "add" SWAT 3 to WBG (we'll be doing this later). Then, enter the resolution you want to play the game at. Finally, under "Force Key", pick another key you will use to actually set the game to run in a borderless window. Go ahead and close the settings window. The game should start up in a tiny window in the top-left corner of the screen. When you get to the main menu, hit whatever Add Window keybind you set up. Alt-tab out of the game, and right-click on the WBG tray icon. Select "Settings", "Game Settings". Select SWAT from the dropdown menu. Enter your resolution one more time and make sure that "Manage Mouse" and "Lock to game window" are selected. Apply, and close the window. Close SWAT as well, just to make sure the WBG settings take. 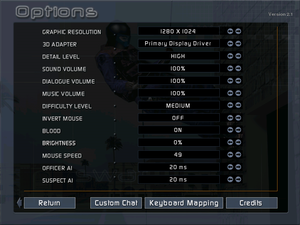 When run through DxWnd, you can now use your WBG borderless window keybind to force SWAT 3 into a borderless window. DxWnd can be used to simplify transition between 16-bit and 32-bit color mode. Launch DXWnd. Click on Edit and Add. In a name field type in: SWAT 3. In a path field click on a button ... and navigate to a folder where you've installed SWAT. Choose Swat.exe and press Open button. Go to a Color tab. And check a field Force 16BPP desktop. Click OK and minimize DXWnd window. Launch a game using a shortcut with -window command line argument. Once you end up playing, close a game and DXWnd. Upon closing, DXWnd is going to ask whatever you want to restore previous Desktop settings - answer yes, to switch back to 32bit color mode. TGOTY : only in english. For Windows 7, 8, and 10, the game will crash if display scaling on high DPI settings is enabled. For Windows 7, 8, and 10, the FMV movies will cause the game to crash due to the codec no longer being supported. This usually gives a "DDERR_Generic" error message but sometimes the game just shuts down without warning. Go to the game's compatibility options. Check "disable displaying scaling on high DPI settings". Manually download the required codecs from http://www.swat3lastresort.info/index.php/swat-3-video-directx-fix. See the Windowed section in this article for information specific to this game. ↑ 3.0 3.1 File/folder structure within this directory reflects the path(s) listed for Windows and/or Steam game data (use Wine regedit to access Windows registry paths). Games with Steam Cloud support may store data in ~/.steam/steam/userdata/<user-id>/560370/ in addition to or instead of this directory. The app ID (560370) may differ in some cases. Treat backslashes as forward slashes. See the glossary page for details. This page was last edited on 15 December 2018, at 02:09.